Greetings from CHUR, Switzerland my brothers and sisters, I write you from a room at a hostel here (don't know the name) that currently is being co-inhabited by a bunch of fat naked old Euro dudes......um, yea. It's morning, we played a club here last night called Selig, it was a great show, the Swiss kids really get into music and know how to cut loose. Chur is very small (actually the oldest and first real town in all of Switzerland) and thus I guess "hotel" here means "hostel". 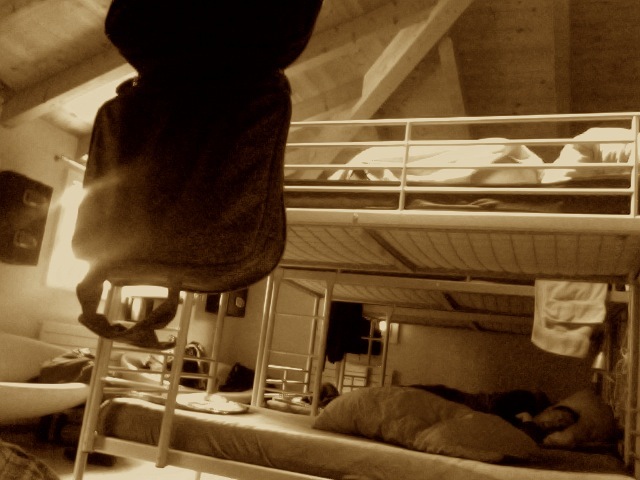 No biggie, all the bands on this tour package got thrown into this large room with bunk beds summer camp style :) ....that is, no biggie until 10 huge European dudes all came into our room as well to sleep off shame from patronizing the many brothels on this street....who knew there was a red light district in Chur? Well, brothers and sisters there IS and it is verrrrry interesting. So now I'm listening to the gorgeous sound of old churchbells ringing from a block away coupled with the snoring of a very overweight senior Swiss man who apparently doesnt like to sleep with pants or shorts on.....Proscht! More to come, including pictures and a recap of Basel and Zurich!